The practical driving test may or may not involve level crossing as it depends on whether there’s one situated close enough to be incorporated into the driving test routes. 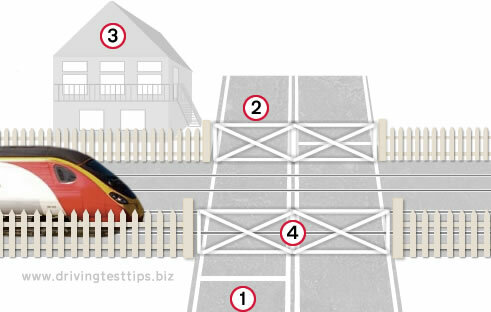 Due to the dangers associated with level crossings, you can be reasonably sure that the driving examiner will take you on a route that involves a level crossing if one is situated close enough to the test centre. There are several deaths each year attributed to the misuse of level crossings, many more non-fatal accidents and hundreds of near misses involving pedestrians and motorists who seem willing to take unnecessary risks. This section explains the types of level crossings in the UK and how they should be approached in the driving test and thereafter. 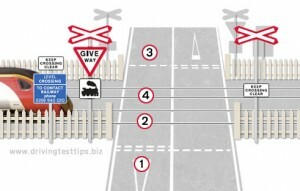 Detailed are the main types of level crossings that you are likely to encounter during every day driving and possibly during your driving test. Followed by an understanding of level crossing lights and signs and level crossing safety, rules and fines. Automatic barrier level crossings are frequently seen in the UK and can utilise either a full barrier extending the entire width of the road or half barriers the extend across one side of the carriageway. As a train approaches the level crossing, the amber light will initially show followed by the flashing red lights. You must stop and wait at the white stop line when the amber or red lights are illuminated. An audio alarm is emitted for pedestrians. Drive carefully up to the crossing and be prepared to stop at the white line should the lights flash. 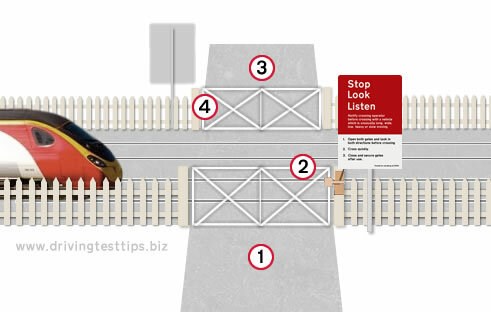 Before entering the level crossing ensure your exit is clear and that you can safely exit the crossing. If the amber light is on or the red lights are flashing you must stop behind the white line. If the amber light comes on and you have already crossed the white line, keep going to exit the crossing. Red lights may keep flashing for some time after the train has passed. This means another train is coming. Only cross when the barriers are fully raised and the lights go off. Gated level crossings are manually controlled by railway staff and utilised two gates that extend across the entire width of the road. Once the train has passed, the operator will reopen the gates. Only proceed past the stop line when both gates are fully open and railway staff have exited the crossing area. If there appears to be a long delay after the train has passed, this usually means another train is coming. Drive carefully up to the crossing being observant of railway staff preparing to close the gates. Ensure the exit of the crossing is clear before entering to allow for safe exit. A railway member of staff will shut the gates if a train is coming. Wait until the railway member of staff has fully reopened the gates before crossing. Open level crossings are used far less frequently than automatic or gated crossings due to the dangers associated with no barriers. They can be located on rural roads where traffic is at a minimum. Drive with extreme caution up to the crossing and be ready to stop behind the white line. Look both ways to ensure a train is not coming. Before entering the crossing ensure your exit is clear. User operated level crossings have gates or barriers that are operated by the person wishing to cross the level crossing. These crossings may sometimes have warning lights. A person must only cross if the green light is shown. Telephones can sometimes be available at these crossings. Barriers or gates must both be opened before crossing, checking that it is safe to proceed and once crossed, both gates or barriers must be closed. Stop, look and listen in both directions to make sure a train is not coming. If a train is coming wait in a safe place. Open the gates on both sides of the level crossing. Look once again to ensure no train is coming, make sure the exit is clear, cross quickly and stay alert, do not stop on the crossing. Close both gates after crossing, never leave them open. level crossing signs and light signals guide. 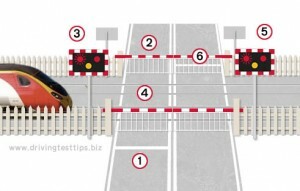 The types of level crossings detailed in this section are frequently seen on many UK roads. There are however many variations of level crossings and these forms change depending whether they are on public or private roads or for vehicles, pedestrians or horses. The level of protection varies on these factors and also on the location of a crossing, such as whether it is in a busy location, located close to junctions and also the nature of the railway traffic itself.